Digital Performer, and Performer before it, has been a Mac-only program for almost as long as you’ve been able to buy a computer called “Macintosh.” The first Performer release was available in 1985. (Professional Composer, before that, was out in ’84.) Performer, accordingly, has had a big impact on the history of the sequencer, and later the audio and MIDI arrangement hybrid that came to be known as Digital Audio Workstation, throughout the history of the genre. But it’s never run on any Microsoft platform – until now. In an announcement I doubt anyone saw coming, MOTU has announced they’re shipping Digital Performer 8 for both Mac and Windows, in both 32-bit and 64-bit modes. That means, of the major conventional DAWs, nearly all run on both platforms: Pro Tools, Cubase/Nuendo, and now DP, to say nothing of tools like Ableton Live or Reason. All that’s left are Cakewalk’s SONAR, and Apple’s Logic – and Logic is the one made by Apple. Of course, being cross-platform isn’t always good for business – just ask the ghost of Opcode Studio Vision Pro – but recent changes in how software is developed have made cross-platform compatibility and testing more straightforward than they once were. 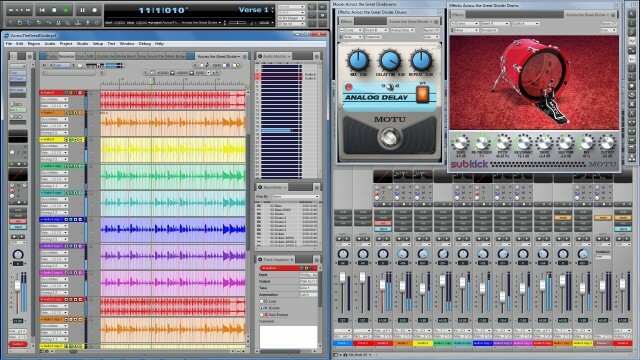 For Windows users, you get VST plug-in support and ReWire compatibility. “Punch Guard” adds four seconds of audio before and after each record, in case you punch in too late or out too early. A new video engine supports 720p or 1080p with flexible output options – aside from your main screen, you can use a second display or HDMI or (very cool) SDI. In the producer community, I often hear skepticism about who uses DP. One major answer: the scoring and video production markets, in a big way. And MOTU’s recent developments in video hardware (hello, Thunderbolt) make them a player to watch, even when industry heavyweight Avid is casting its shadow. New guitar amp and bass cabinet plug-ins, guitar pedals, modeled analog delay, multi-band dynamic EQ, de-esser, kick drum enhancer, and modeled vintage spring reverb. Give a DSP programmer a cookie, and … you wind up with a DAW full of fun sound design toys. Themes for the UI, including “None More Black,” ensuring full Spinal Tap joke compliance for this industry-leading DAW. That means that Mac users still have plenty to sink their teeth into. Also, if you happen to be using the CueMix FX software in MOTU’s audio interfaces, you can now control that software via an iPad. Here’s what’s cool there: they’ve done the implementation in OSC (OpenSoundControl). It’s great to see a big industry player throw some weight behind that format. That’s all we’ve got now – that and a screen shot – but I’m interested to know, any Windows users intrigued by getting to run DP? Or do you have no idea what it actually offers?